The twenty-first century is a time of change for early learning in museums, due in part to society's evolving view of childhood, from an age of innocence to understanding the robust learning that defines the first years of life. This perspective is a catalyst for international conversation and continues to raise attention and interest across society. Object Lessons and Early Learning leverages what is known about the cognitive development of young children to examine the power of learning through objects in museum and heritage settings. Exploring the history and modern day practice of object-based learning, Shaffer outlines the rationale for endorsing this approach in both formal and informal learning spaces. She argues that museums, as collecting institutions, are learning spaces uniquely positioned to allow children to make meaning about their world through personal connections to cultural artifacts, natural specimens, and works of art. A range of descriptive object lessons, inspired by objects in museums as well as from the everyday world, are presented throughout the text as examples of ways in which children can be encouraged to engage with museum collections. 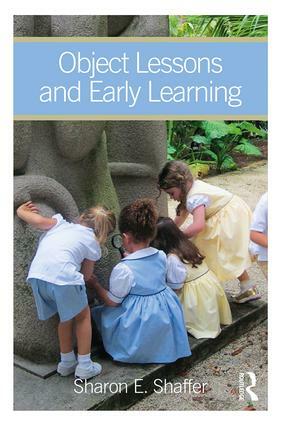 Object Lessons and Early Learning offers insights into strategies for engaging young children as learners in museum settings and in their everyday world, and, as such, will be essential reading for museum professionals, classroom educators, and students. It should also be of great interest to academics and researchers engaged in the study of museums and education.